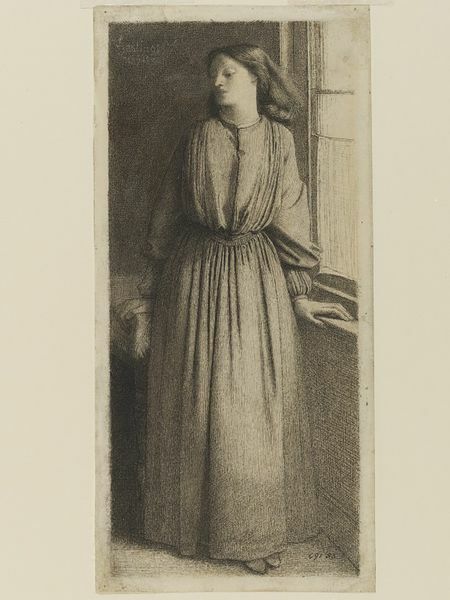 Elizabeth Siddal (1834-1862) was introduced to the Pre-Raphaelite circle of artists (of which Rossetti was a leading member) by Walter Deverell, probably in late 1849. Deverell had found her working in a milliner's shop in Leicester Square, London, and she posed for his painting Twelfth Night (exhibited 1850). By the winter of 1851-1852 she had ceased to model for anyone except Rossetti, and it is thought they became engaged at around this time, though they did not marry until 1860. 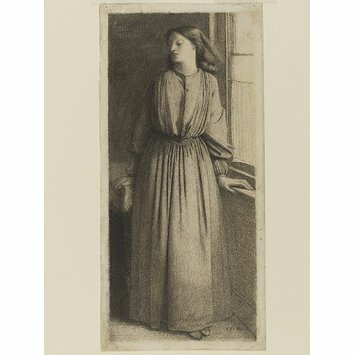 Her health was fragile--she suffered from tuberculosis and was often ill. Rossetti made drawings of her in the course of their daily life (she was not only his model, formally and informally, but also, from 1852, his pupil). This is a study made during a stay in Hastings, on the south coast, where Rossetti had taken her to recuperate from her latest bout of ill-health. Mikael Ahlund, ed, including an essay by Martin Barnes, The Pre-Raphaelites Stockholm: Nationalmuseum, 2009. ISBN: 978-91-7100-809-1.